Generally felt unmotivated and without a lot of creative juice. I still got a lot done, through effort rather than inspiration, though somewhat less of it was narrative, and more of it was code. Almost all of the code work this week happened in the story-compiler. You see, I had this epiphany – which I should have had quite a lot sooner. Sometimes you want to take off your gamedev hat and play something someone else has made. Sometimes your budget is tight. I missed last week’s development blog post due to the pressure of other things, so I’ve got two weeks to cover. On the narrative side, I’m nearing a long-awaited story milestone. The prologues are complete for each of the eleven protagonists, and all but two of them are written through to the end of the rather dense and complicated first day of the story proper. Once those last two characters are written through, that will represent a major milestone. That brings us to (today), 88 scenes and 232,814 words. That’s more than Dune (the book), or Neverwinter Nights (the game) [This isn’t a competition! ], but we’re not really into the full swing of things yet. That will be in the second Act, which is where the bulk of the narrative technology should start to shine (I hope!). Here’s SNAFU’s scene chart for what is officially ‘day one’ of the story. There’s stuff up above that, but that largely happens in prologue (some character narratives start earlier than day one). Heck, this isn’t really even day one, proper, all of this one starts late in the day. This is mostly just an evening of story, starting around dusk (except for scene 315 up near the top there, which is an afternoon scene). 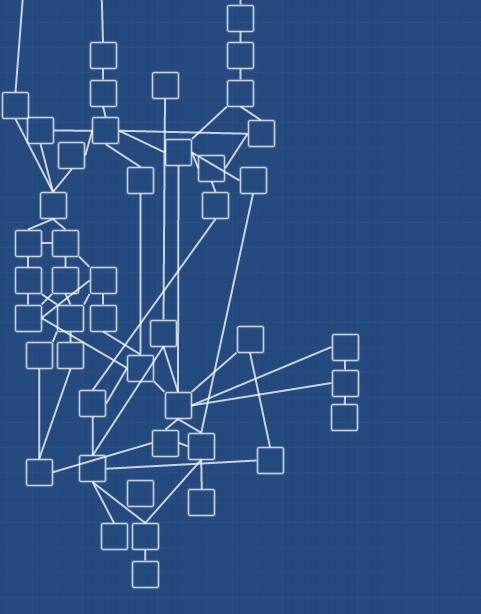 Choice-based interactive-fiction comes in a whole bunch of narrative models. If you haven’t read the These Heterogenous Tasks article, Standard Patterns in Choice-Based Games, you should run right out and do that. It’s excellent, and I’ll be making some references to it. I’ll wait. Promise. Done that? Good, let’s move along.